The 344 acre the park encompasses what was once the town of Preparation. In 1853, Charles B. Thompson broke from the Mormon wagon train to Utah after receiving a message from the "Spirit." The Mormon leader and elder led 50 to 60 Mormon families to Kanesville, now Council Bluffs. Upon much searching, Thompson and a few select men chose the area called "Monona," an Indian name meaning "Peaceful Valley." Here they organized the town of Preparation, complete with houses and schools and started Monona County's first newspaper which Thompson owned and operated. This place was their "School of Preparation for the Life Beyond." The Mormons soon learned they had discovered one of the richest farming valleys in the new territory. Realizing the valley's potential wealth, Thompson's newspaper printed this message from a spirit he called "Beneemy": "I appoint Charles B. Thompson chief steward of my house to receive, hold, manage and direct all the treasures of my house to him." Believing this, the people turned over all deeds and possessions to Thompson, who grew quite wealthy. Thompson also taught his followers to call him "Father Ephraim" after the Ephraim in the Holy Scriptures. In 1856, the people realized their mistake and asked for the return of their property, but "Father Ephraim" refused. Angered, the people decided to lynch Thompson. After receiving warning from a young follower, Thompson escaped the mob by hiding in a friend's attic in Onawa. Thompson fled the state, unable to secure the deeds. Many disillusioned Mormons then left the valley and headed for Utah. In 1856, the Iowa Supreme court divided the land equally among the remaining families, whereupon the town of Preparation began to grow. At one point, Preparation had sixty-seven houses, a post office, skating rink and blacksmith shop. But by 1900, the town had faded and all that survived was a stockyard operation which closed in 1946. Martha and Walter Perrin, descendants of the original Mormon families, sold 82 acres of their land to the state of Iowa in 1934. In 1969, Martha Perrin sold another 157 acres and, eventually, the Perrin family homestead site to the state. These acres of land once contained the town of Preparation, including the valley the Mormons had settled many years ago for their "Preparation for the Life Beyond." Preparation Canyon State Park is an excellent place for a picnic or family cookout. Picnickers can enjoy themselves, while also enjoying views of the dramatic ridges an unique Loess Hills. Ten hike-in camp sites, each with table and fireplace, are provided in the eastern half of the park. Registration for the isolated and secluded sites are obtained by self-registration at the east parking area. Camping Fees are to be paid at the registration area. Several trails wind their way through the rugged Loess Hills, and along the many streams and springs found in the area. These trails will also take you to the hike-in camping sites. A nature study area is located in the eastern area of the park. The 344 acre Preparation Canyon State Park is a remote and lovely area still relatively untouched by humans. 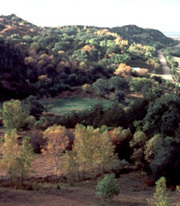 The park is located in Iowa's unique Loess Hills and is surrounded by dramatic ridges on the north, south and west. It provides a beautiful backdrop for hikers and family picnics. Picnic tables, a shelter and non-modern toilets are provided. In order to help protect the canyon's natural seclusion and the remaining evidence of its dramatic past, camping is restricted to hike-in camping only at the designated sites. Preparation Canyon State Park lies at the very north end of Loess Hills Pioneer State Forest. Preparation Canyon State Park is located approximately 5 miles southwest of Moorhead, Iowa and approximately 5 miles north of Pisgah, Iowa. Onawa, Iowa is approximately 20 miles northeast of the park.